We are dedicated to making a positive impact in our community. We partner with humanitarian organizations to supply shoes, hats, medicine, and other needs to local children and their families. GRAND OPENING OF THE PRESCHOOL AT PILLIRAY! We are thrilled to announce that in April of 2018, together with the Wakatinku foundation, we successfully completed the preschool building project at Pilliray. We had a lovely day at the preschool complete with performances from the students, sharing a traditional Pachamanca lunch of potatoes cooked in the ground, putting the ceremonial bulls on the roof to ward off bad spirits and enjoying the day with the children, families, teacher and the locals that made the construction happen. In addition to building a beautiful new preschool, we added flush toilets, a water storage tank, a septic tank, and water pipes to the oid school building which will become the kitchen and dining room. We also purchased tables and school supplies to furnish the new building. Our next project is to complete a fence around the perimeter of the school. As if to point out the need, a large sow and her piglets came into the playground while we were having lunch, giving us the needed reminder of why this part of the project is so important! We are very excited to report that we have partnered with the Wakatinku Foundation and Inmed, a Peruvian humanitarian organization, to provide mebendazole, an anti-parasitic medication, to all 3 of the schools that we have sponsored. Because these children live in close contact with animals, gastrointestinal parasites are common and lead to chronic intestinal symptoms and malnutrition. The directors of the schools will work with the local health clinics to administer the medications to the children twice a year for the next five years, improving their quality of life and basic health. In May of 2016, we partnered with the Wakatinku Foundation, a US based 501c3 organization to visit the preschool at Pillaray and the primary schools at Ancoto and Choquecancha to deliver much needed supplies. Every single child in all of the schools received a new pair of shoes--we delivered over 338 pair of shoes! We were honored by singing and dancing by the children at all of the schools. Prior to the visit, we met with the teachers at the school who told us that they were lacking in basic supplies such as plates, cups, toilet paper, soap, towels, a blackboard and school supplies. We met up with the teachers in Cusco and went on a shopping spree and on May 28, 2016, we personally visited the school in order to deliver the supplies. We met with the teacher and are committed to try and help partner with locals and the Wakatinku foundation in order to build them a new school house. We can visit the Pillaray schoolhouse as part of our tours of the Sacred Valley. Contact us if you are interested in bringing along supplies to help the kids. . When we were at the preschool at Pillaray school, we noticed that the children did not have hats to protect them from the strong rays of the sun that shine here at high altitude. So, with funds from the Wakatinku Foundation, we were able to have sombreros made and this week, delivered them to the school. 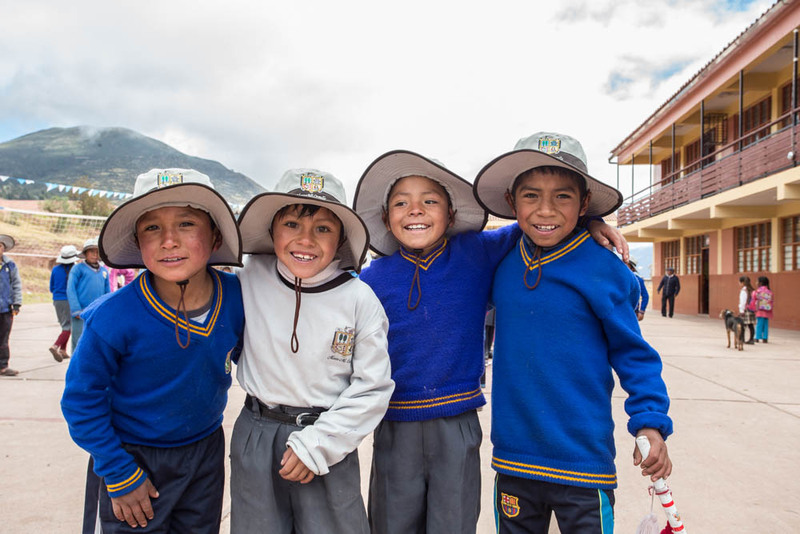 Now the kids will have something to protect their skin and eyes from the blazing sun that shines year round here in the mountains of Peru.